We are getting somewhere. I honestly can’t say much more about this episode because almost nothing happened. Onoda discovered that Naruko goes to school with him, Onoda finally decides to join the cycling club, and Onoda continues to impress the people around him. That is our episode in a nutshell. Is that a bad episode? Not really, but I do want to see more from a series after the fifth episode. At least they have a long time to give us more. That doesn’t sound like a bad idea at all. Well, Onoda is really hungry the next day at school. I would say that it sounds about right, but it really doesn’t. Just adding that little stunt shouldn’t be getting to Onoda as much as it is. Oh well, they wanted to emphasize the fact that he is doing things that are unlike anything he has ever done before. Unfortunately, lunch is stuffed bread and that means the weak Onoda will lose out in this natural selection event. Luckily, Naruko is in that line and he bought way too much bread. He gave some to Onoda and the redhead continues to push Onoda to join the cycling club. 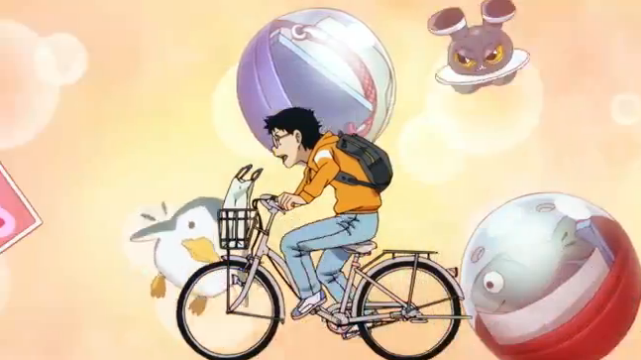 This seems futile until Onoda gets a flat tire while conveniently biking ahead of Miki’s older brother. The buy fixed the tire and gave Onoda a beginner’s guide to competitive cycling. Onoda’s head begins to spin as he has way too much information to take in. Onoda was pretty close to joining at that point and Naruko’s plan to make him watch practice was very effective. Onoda decided to join the club, but it was on a very special day. All six of the first years will participate in a sixty kilometer race. The secret behind this is that the race will determine which first years will participate in the preliminaries for the inter-high tournament. The race better be over soon. Have you even touched a woman before? I am very mixed when it comes to my opinion of this series. On one hand, I do appreciate what is going on. You have the raw potential of a kid that loves to ride his bike entering the world of competitive cycling. I am eager to see what happens in this race. Heck, I would love to see the senior members of the club do some cycling. My favorite part of sports series is seeing the various specialties that the players boast. On the other hand, the pacing makes me think that we will get to the inter-high preliminaries in season two of the series. That doesn’t sound bad until you realize that the next season of this series would start on episode thirty-nine. Pacing is a very important part of a series and I would have to fail the writers if I were grading the pace of the series. This season is far too strong to support something that will start to bore people. I think that it is not crazy to think that Yowamushi Pedal bores a lot of people. I have been told that the manga is just as slow and that frightens me. Excuse me while I take a much needed nap. I learned how to kick a soccer ball so that these things wouldn’t happen. Honestly, I don’t know what else to say about this series. Onoda isn’t the best protagonist, but I have definitely seen worse. I think that the other characters are much more entertaining than the little otaku. Naruko, Imaizumi, and the senior members all seem as though they can be fairly interesting. Let’s talk about Imaizumi for a second. I would like to recommend the post-credit material of this series to everyone. Why is this? We get a lot of funny stuff out of it. My favorite moments in the series are probably from this section. Imaizumi attempting to sit through to sit through an episode of that ridiculous anime made me laugh. The fact that he watched it and was trying to understand things was really good. Aside from that, I am hoping to see some fun interactions between Onoda and the lanky guy with green hair. I am too lazy to look up his name, but they are both climbers. I assume that they will train together because this is an anime. Also, the really big guy in the club is sure to piss off Naruko. They are both sprinters and I am guessing that Naruko will fall short during friendly races. Everyone already has a counterpart.